Bib Size: 7 .5" x 5.75"
Bib Size: 7.5" x 5.75"
THERE IS A $94 RUSH CHARGE ON ORDERS WITH LESS THAN 3 WEEKS NOTICE. PLEASE USE THE CORRECT SELECTION. 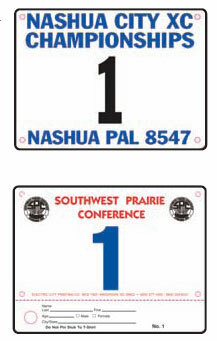 THE RUSH CHAGE IS IN ADDITION TO THE BIB COST, DO NOT ONLY SELECT RUSH CHARGE, YOUR ORDER WILL NOT BE PROCESSED. YOU MUST SPECIFY A NEED-BY DATE ON THE CHECKOUT PAGE IN THE ORDER COMMENT BOX AT THE BOTTOM, WE WILL CONTACT YOU IF YOU DO NOT AND IT MAY DELAY THE ORDER.